A special tribute performance from the Rhodes MasterSingers Chorale honoring Dave Brubeck, a remarkable and legendary jazz pianist on Friday, April 25. 7:30pm at the Evergreen Presbyterian Church , 613 University St. Memphis. Dave Brubeck passed away in December 2012, and his wife Iola passed away last month. His most famous works include Take Five and Blue Rondo a la Turk. The MasterSingers have teamed up with the Memphis Symphony Orchestra to perform a variety of Brubeck’s choral music. Some selections include: “You Are My Hope,” “Though I Speak with the Tongues of Men,” “40 Days and 40 Nights,” and Pange Lingua Variations. 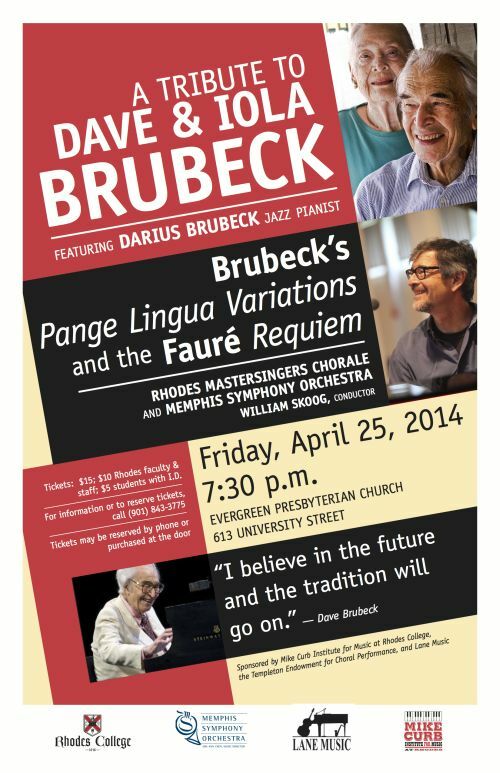 The MasterSingers will also be joined by Darius Brubeck on piano, one of Dave Brubeck’s sons. Darius will play with the Rhodes Faculty Jazz Quartet, and true to jazz, all of Brubeck’s choral music will have plenty of room for Darius to improvise on the spot. A beautiful tribute to an incredible and influential musician.